Italian rabbi; born at Alessandria della Paglia in the second half of the seventeenth century; died at Reggio nell' Emilia in 1739. 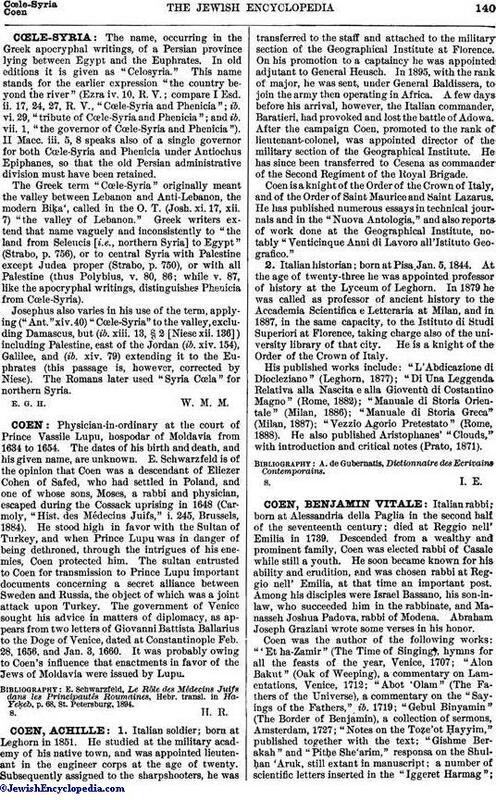 Descended from a wealthy and prominent family, Coen was elected rabbi of Casale while still a youth. He soon became known for his ability and erudition, and was chosen rabbi at Reggio nell' Emilia, at that time an important post. Among his disciples were Israel Bassano, his son-in-law, who succeeded him in the rabbinate, and Manasseh Joshua Padova, rabbi of Modena. Abraham Joseph Graziani wrote some verses in his honor. 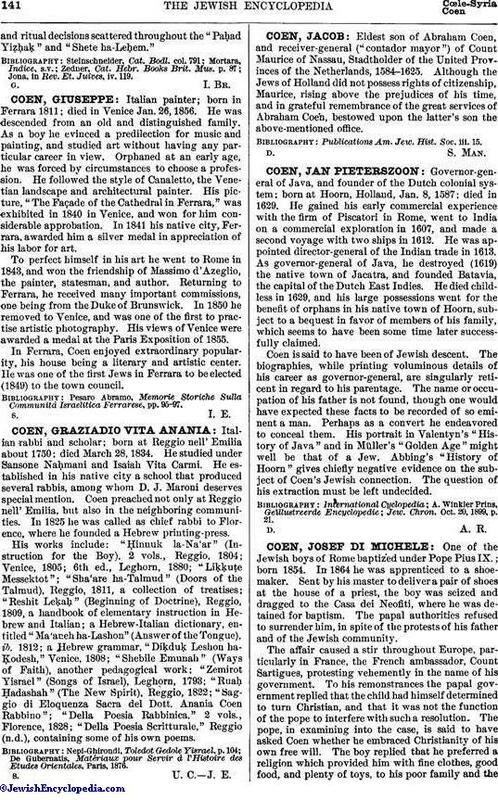 Coen was the author of the following works: "Et ha-Zamir" (The Time of Singing), hymns for all the feasts of the year, Venice, 1707; "Alon Bakut" (Oak of Weeping), a commentary on Lamentations, Venice, 1712; "Abot 'Olam" (The Fathers of the Universe), a commentary on the "Sayings of the Fathers," ib. 1719; "Gebul Binyamin" (The Border of Benjamin), a collection of sermons, Amsterdam, 1727; "Notes on the Toẓe'ot Ḥayyim," published together with the text; "Gishme Berakah" and "Pitḥe She'arim," responsa on the Shulḥan 'Aruk, still extant in manuscript: a number of scientific letters inserted in the "Iggeret Harmag";and ritual decisions scattered throughout the "Paḥad Yiẓḥaḳ" and "Shete ha-Leḥem." Jona, in Rev. Et. Juives, iv. 119.